Your best protection against cancer is early detection. A mammogram offers the best opportunity to detect breast cancer at an early stage. A mammogram is an easy, generally painless test. The key to successful mammogram screenings is to have them done routinely - once is not enough. Yearly mammograms can detect changes in the breast that can develop into cancer. Cervical cancer is one of the most treatable cancers if it is detected early. A Pap test offers the best opportunity to detect cervical cancer at an early stage, when successful treatment is likely. A Pap test is a quick and simple test that identifies abnormal cells in the cervix that can develop into cancer. Regular Pap tests can detect these changes before they have a chance to turn into cervical cancer. Despite the success of mammograms and pap tests in detecting breast and cervical cancer, not all women get these tests. Don't wait until it's too late, get screened today! Who is Eligible for NC BCCCP? 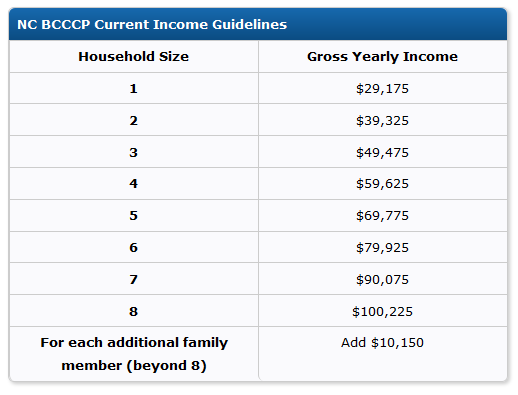 * For example, if there are five people in the household, your yearly income cannot be above $69,775 to qualify for BCCCP. Note: Income guidelines are determined annually by the federal government. Current guidelines may be accessed through local Departments of Social Services.